This is part of the foreword from the "Picasso's Edited Ceramic Works" catalogue by Alain Ramié. 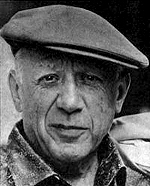 It was on the 21st July 1946 that Picasso, sojourning at the home of his friend and engraver, Louis Fort, at Golfe-Juan, decided to visit the annual potters exhibition in Vallauris. What were his actual intentions? Was it for the sake of a visit or rather to discover something that could capture his interest? The fact remains that he let himself be trapped by the mischievous genius he thought he could provoke. As the organizers of the exhibition were commenting on each exhibitor's pieces, he took a particular interest in the Madoura stall, and asked to be introduced to the authors of these works. Suzanne and Georges Ramié then welcomed him in the Madoura Pottery workshop. He thus readily ended that day, grappling with the fresh clay and modelling three subjects which were left to be dried and baked. Only one year later Picasso came back and asked about his pieces. Much to his delight, they were shown to him in excellent condition. He at once asked to get back to work. His request was granted! A part of the workshop was arranged for his behalf, and he promptly set to work, taking from a portfolio sketches that he certainly drew in anticipation of that moment. Picasso tackled ceramics with his genius and prodigious creative imagination, under the close initiation of Suzanne Ramié who provided him with her vast knowledge of the tricks of the craft. Then it came to pass that, after an intense period of work, he sought the ability to repeat certain of his works. It was then essential to transpose into ceramic reality the method already put into practice in graphic art, but for this new application, the basis of the graphic design originated from very different principles. 1st: the authentic replica of an original by exact repeating of volumes and illuminations. 2nd: the transfer from an original subject engraved on a hardened plaster matrix, by applying a fresh sheet to take clay impression. This second method, called "Original print of Picasso", is authenticated by a stamp engraved on the reverse side of each piece. These two methods combined are commonly called Ceramic editions of Picasso". In both cases, pieces so edited are certified by an edition monogram or a graphic sign that appears on the reverse side, neck or base; and for some of them by the piece number within a production series.